Does Music Impact Community at the University of Augsburg? Does music really impact on the community here? This was one of my main questions, when I stood in front of the institute for music at the University of Augsburg. Music is such an important thing. It brings people together with invisible threads, as the famous Australian poet Pam Brown has said. 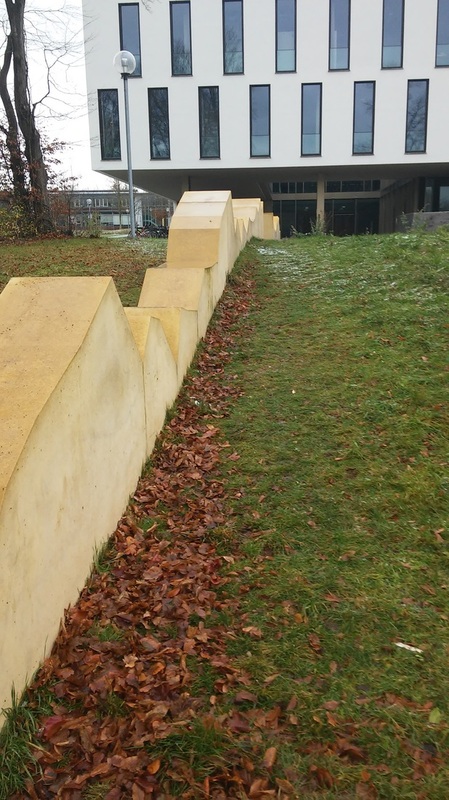 But when you´ re standing at the great lake and have a view of this concrete yellow work of art and the modern white building in the background, do you really feel the strong connection between all people who love music? The first thing people associate with this artefact is hills or even the Alps. Only a few know that these yellow „waves“ show the melody of a little part called „promenade“ in Modest Mussorgsky’s suite “Pictures at an Exhibition“. This tune symbolizes the composer’s walk from one picture to another at the exhibition. Broadly defined this work of art should lead you the way to a place where music plays a big role in bringing people together. Many students I talked to were astounded when I told them. Mainly, they use it for sitting on and having a break with their friends on a sunny day. Even though they may not know anything about the meaning of this artefact, it has its purpose. It brings people together to have a nice time. And maybe they will be curious enough to have a look inside the building and become part of this strong community when they hear all the singing and different instruments playing in the background while they are sitting there.